TORONTO (Reuters) - Newmont Mining Corp <NEM.N> laid out plans on Thursday for new projects to grow gold production and cut costs, while reporting market-beating profits and output forecasts that position it to take the title of world's largest bullion producer in 2018. Newmont, whose 2017 production slightly lagged industry leader Barrick Gold <ABX.TO>, boosted its 2018 capital budget by $300 million, to $1.2-$1.3 billion, after approving a power project at an Australian mine and expansion of a joint venture mine in Nevada. Chief Executive Gary Goldberg said Newmont's efforts to attract a broader investor base, by sweetening its dividend and focusing on shareholder returns, is drawing increased interest from generalist investors. "We need to make ourselves more attractive, which I think we've done by upping our dividend yield," he said in an interview with Reuters. And as the gold industry studies blockchain technology as a way to confirm ethical and sustainable production, Newmont is interested in trialing it this year, he said. "We definitely want to be involved in it, we think it's a good thing for the gold industry overall," said Goldberg, adding that other miners may launch trials before year-end. Blockchain, the technology behind cryptocurrencies like bitcoin, is drawing interest from a range of industries as a means to track minerals and add security and transparency in trade and other financial transactions. 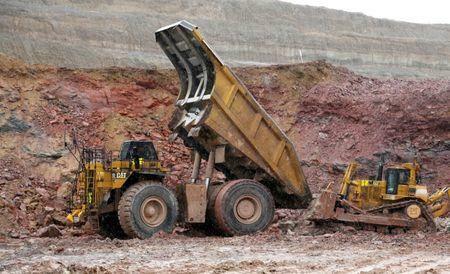 Newmont, which has mines in the Americas, Africa and Australia, forecasts annual gold production of 4.9-5.4 million ounces in the next two years and 4.6-5.1 million ounces annually through 2022. In contrast, Canada's Barrick cut its 2018 forecast to between 4.5 million and 5 million ounces of gold, while targeting 4.2 million to 4.6 million ounces of annual production from 2019 to 2022. Colarado-based Newmont said low-cost production from newer mines, coupled with productivity gains, helped drive an 88 percent gain in full-year free cash flow to $1.48 billion. Ending 2017 with $3.3 billion cash on hand, Newmont reported a fourth-quarter profit of 40 cents per share ahead of analysts' expectation of 38 cents, lifted by bigger-than-expected production. Earlier this week, Newmont replaced its gold-price linked dividend policy with a quarterly payout of 14 cents per share, which it said translates to a 1.5 percent yield. On Wednesday, the company reported gold reserves of 68.5 million ounces for 2017, unchanged from 2016, as it replaced reserves through exploration, projects, revisions and acquisitions.